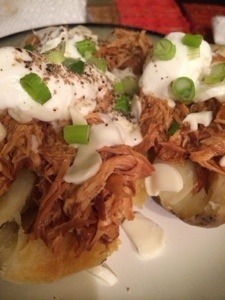 BBQ potato’s are a fun carnival or festival treat but they are easy to make at home with a few healthier tricks. A great weeknight meal for the family that everyone can enjoy. 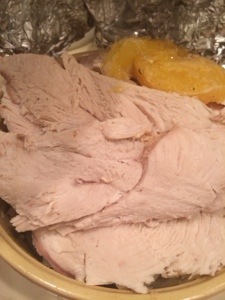 Place chicken in a slow cook and season with salt and onion powder. Then pour in BBQ sauce and mix together. Cover pot and cook on low for 6-8 hours or until you can pull meat apart with two forks. 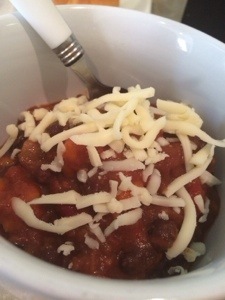 Once meat is cooked pour everything in the slow cooker into a bowl. Shred the chicken using to forks. Now take your cooked baked potatoes and slice them open on top. Fill each with even amounts of meat. Then top with equal parts of all the toppings. Gumbo was one of the first meals Jay made for me when we started dating. It is the kind of meal that you get out the biggest pot you have and plan to feed anyone thats around. With the air getting cold I am always looking for nice hot one pot meals. Gumbo is traditionally made with a flour based roe. My version is easy to do, gluten free and lower in fat. Start by cleaning all the shrimp and placing the cleaned meat in a bowl and tossing all the shells in a large pot. In the pot add 6 Cups of Water, half of an onion and allow it to come to a boil and simmer for 30 minutes. While it simmers start making the roe. In the biggest pot you have, melt the butter. Once melted completely add the flour and pepper. Continue to stir while with cooks and starts to form a light brown color. Its important to not let it burn. As soon as the color starts to change add about 1/2 water to help it come together and continue to cook. Can add onion and oil continuing to stir with the onion browns. 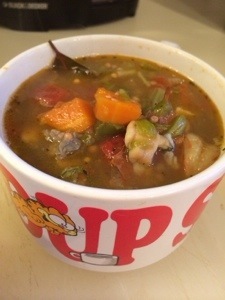 About 5 mins latter add pepper and carrot again stirring and cooking until they begin to become soft. Add chicken broth, bay leaves, salt, chili flakes and old bay seasoning. Then add sliced okra and bring liquid to boil. Next strain the liquid with the shrimp shells save the broth and discarding the shells. Add 4-5 Cups of the liquid to the pot. Now add oysters and catfish. Make sure the liquid at a high simmer. While simmering removing about 2 cups of liquid to a large bowl and whisk in cornstarch. This will form a slurry to help thicken the soup. Pour the slurry into the pot and mix well continuing to simmer for 30 minutes. The soup will start to thicken. Finally add the shrimp and continue to cook for an additionally 10-15 minutes. Serve with rice. Gluten free dessert do not need to always be a challenge. With a little extra rice the possibilities are endless. 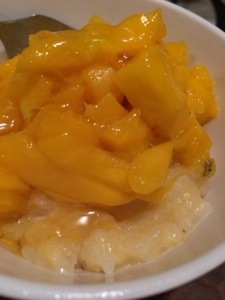 Many Vietnamese and Philapino dessert are rice based. Place the rice in a pot and add milk bring to simmer. Add sugar and 1/4 of the chopped mango. Your looking for the rice to become soft and mushy. You want to cook it slow and continue to mix. You may need to add more milk depending on how humid the air is or how soft u want it. Once the liquid is gone shot the flame and allow it to cool. I prefer to serve it cooled and will leave it in the fridge to chill for a hour it more. 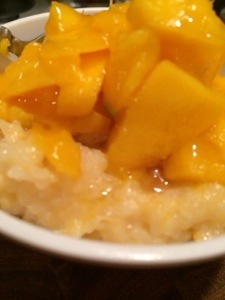 When serving spoon into bowls and top with mango Enjoy!!! With Hanukah and thanksgiving on the same day it was important to come up with recipes that fit both holidays. With plenty of manischewitz on hand I figured this would be a fun way to spike up my cranberry sauce. Place cranberries and wine in a pot. Turn heat on low. Add orange zest and juice. Mix well. Once liquid starts to bubble add sugar and vanilla. Cook on low, stirring regularly until cranberry are soft (about 30 minutes). Mash berries with a potato masher and then add honey and apple sauce. Continue to cook for a few more minutes . Serve cold or warm. 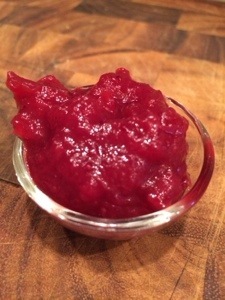 I like my cranberry sauce with large chunks of cranberry but feel free to throw it in a food processor if you like it more smooth. Making a holiday meal that is gluten free / paleo can be a challenge especially with many gluten eating guests. 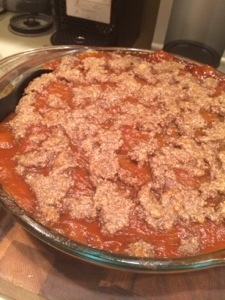 Sweet potatoes alone are great and I wanted to avoid adding all the sugar and junk. 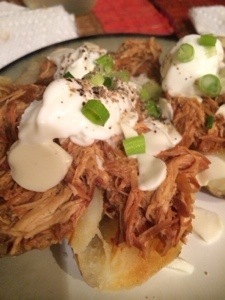 Plus I used the slow cooker to make this dish super easy. Place all the sweet potatoes and apples in a large slow cooker. Pour in the cider and turn the heat on low. Place cover on top and cook for about 8 hours. Once done, give a good stir and mash with a potato masher. Potatoes should be very soft and easy to work with. Most of the liquid with be gone but if not then cook an addition 45 minutes with the cover off. Then using a food processor or blender process the mix until you get the consistency your looking for. You can serve at this point or our into a nice casserole dish and add a topping. Simple mix nuts, butter and cinnamon by hand in small bowl. Sprinkle topping on top and bake at 350 for ten minutes. Enjoy! I am always looking for new products to try and write about. Protein bars are top on that list. Always hard to find ones that are good and gluten free with out all the sugar and junk. I was recently sent a wonderful box full of Seitenbacher foods. The are a company based out of Germany producing a large line of various items from gravy mixes, cereal, pasta to items like protein bars and cookies. Many of their item’s are gluten free. The box I samples included cereal, protein bar, noodles and 2 gravy mixes. The best part was the pasta and gravy mixes. I took some cut up chicken breast and browned with a munch of fresh mushrooms. Then I used with gravy mix and cooked as instructed in a pot. Add the gravy to the chicken and mushrooms, cooked it down with a little bit of white wine and fresh parsley. Served the whole thing on top of the noodles and is really was amazing. Growing up in a german family made me love noodles like this and this was the first time I had any German style gluten free noodle and it was really good. This gravy mix would be great for green been casserole also. Everything else was great tpp!!! Find gluten free cereal that is enjoyable is often a challenge but this was a great choice. Goes great with milk or yogurt and packed with protein keeping me going all day. 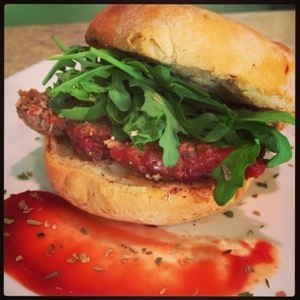 Meatloaf sandwich is a true classic. Really hard to find gf so I figured I would come up with one for the cafe. Give this one a try. Start by mixing all ingredients for meatloaf together holding one half the ketchup on the side. Make sure everything is evenly mixed. Then place meat in a loaf pan and top with remaining ketchup. Bake at 350 degrees for 50 minutes covered for the first 40 min and uncovered for the last ten. You may need to drain liquid every once in a while to avoid it over flowing in the oven. Once done allow it to rest for 10 minutes before cutting. The place a nice large slice on each bun topped with arugula and roasted peppers. Enjoy! !